It’s no wonder new and even experienced gardeners get confused sometimes when faced with the differences between annuals, biennials and perennials. For certain there are differences—big ones—and those will dictate how plants are used and cared for. But it’s easy once you understand the distinctions between the three. Without going into a whole lot of botany, plants exist to create new plants. • Annuals do this in one growing season. They grow, bloom, produce seeds (0r fruits or vegetables that contain seeds) and then they die. With this valuable information anyone growing, say an annual flowering plant such as pansies for example, can interrupt that cycle to prolong bloom times. That is accomplished by deadheading, or removing spent blossoms regularly. The plant continues to produce flowers for the eventual purpose of making seeds. The same concept applies to most vegetables in the home garden. 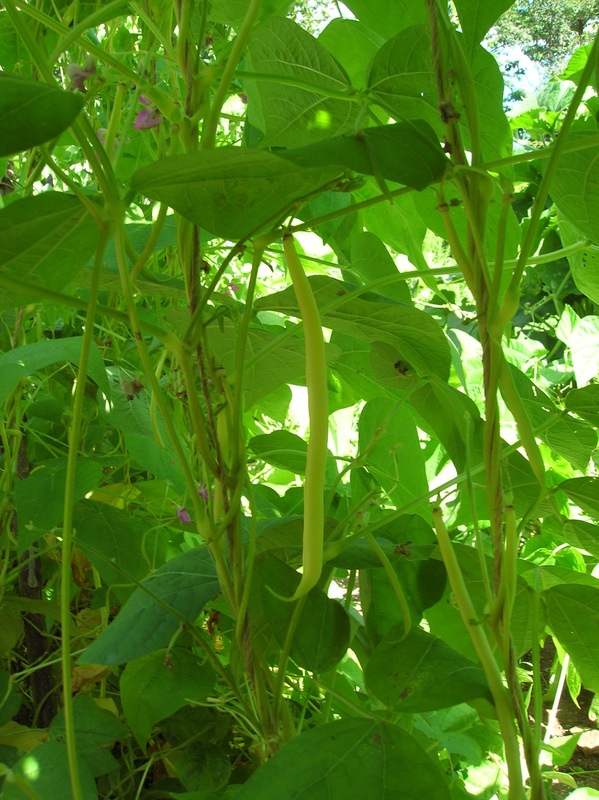 Pick those beans regularly and you prevent them from going to seed, and they continue to produce more beans! Of course there is a limit to how long you—and the bean plant—can keep this up. There are many plants that are annuals, including many flowering plants, vegetables and herbs such as basil or dill. • Biennials are plants that produce only foliage in their first growing season. They go through a period of dormancy (winter) and then they flower, produce seeds and die. There aren’t as many biennials as there are annuals, and these specialized plants include foxgloves, hollyhocks, Lychnis (rose campion) and Lunaria (money plant). Gardeners in the Deep South where the summers are too hot to grow biennials the conventional way, can grow these plants by starting seeds in the fall, which “tricks” them into thinking that is their first growing season. The coming winter constitutes their dormancy period, and the following spring the plants will grow, flower and produce seeds, then die in late spring or early summer. 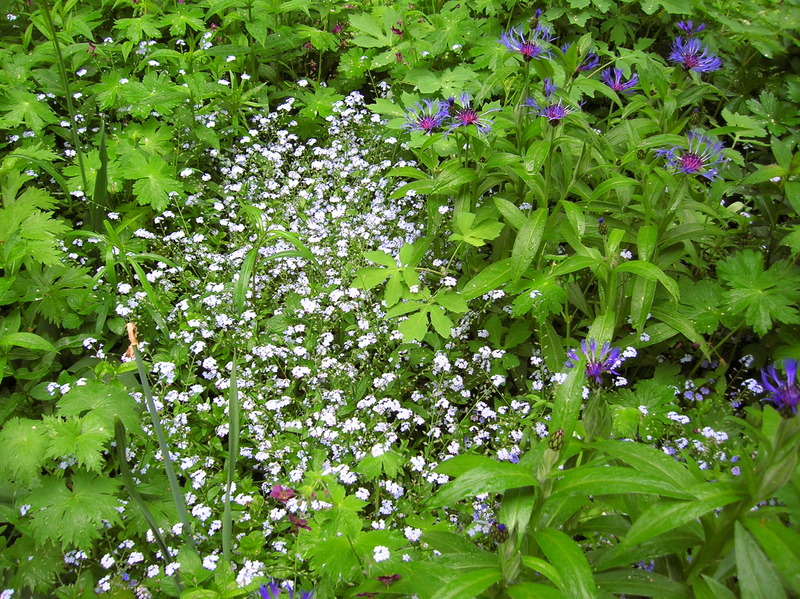 • Perennials are plants that live more than one growing season, becoming dormant in the winters. Some perennials reproduce by seeds, some by corms or bulbs and others by divisions that are created as the plants grow. 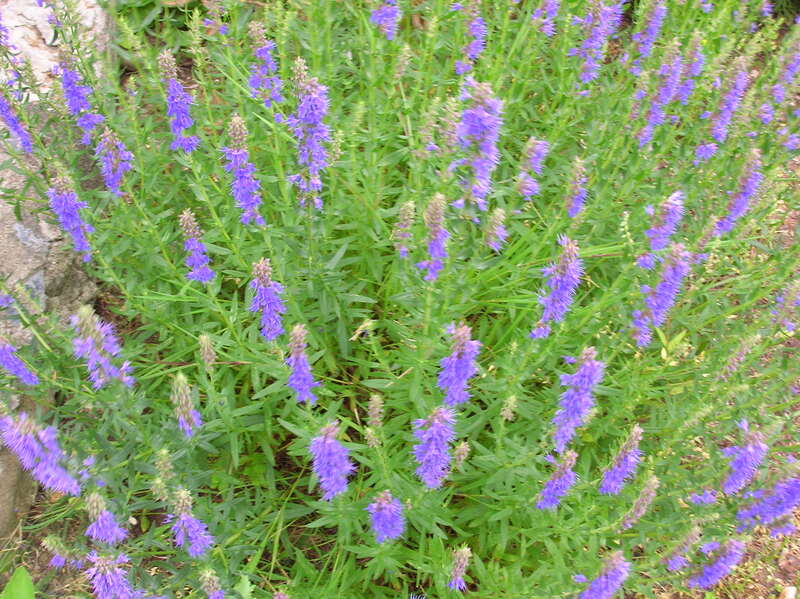 Examples of perennials include daylilies, hostas, iris and herbs such as rosemary and lavender. As the ornamental garden progresses through the spring, it is time to clear out and clean up spent growth like that of spring bulbs, but only after it has turned brown. As long as those daffodil and tulip leaves are still green, they are producing for next spring’s display. 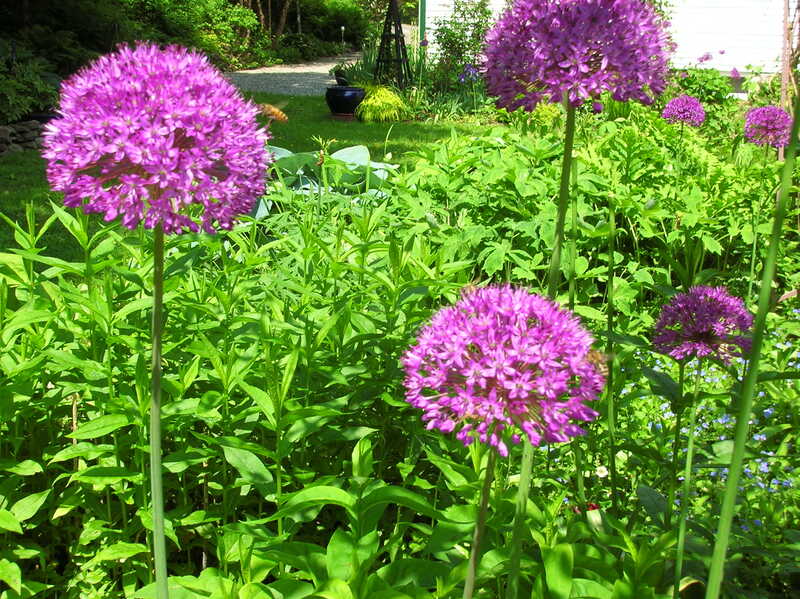 In the meantime, don’t cut, braid or bind up the foliage of spring blooming bulbs. 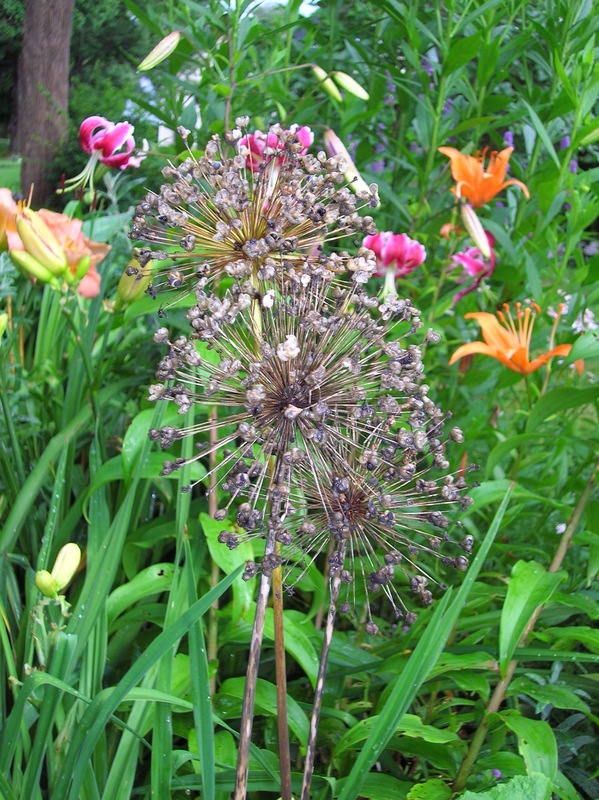 Alliums are still in bloom, and even once they have finished, the spiky seed heads are attractive additions to the summer garden. Leave them in place or if desired cut them back once they and their foliage have turned brown. Pulmonaira or lungwort has finished blooming. This low-growing shade plant is a favorite of hummingbirds that cannot resist the tiny blue and pink bells. Now that the blooms have faded, be sure to remove the seed heads if you don’t want a Pulmonaira population explosion. But if you want more plants, by all means, leave them there. 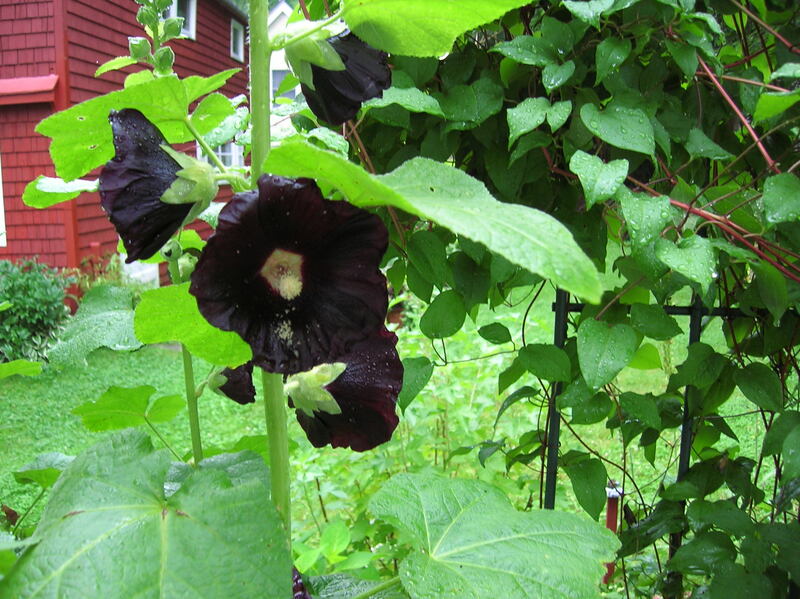 You’ll get plenty to share or transplant elsewhere in the garden. Note that if you have more than one variety of lungwort in your garden, the offspring might not be true to their parents as this is one plant that crossbreeds and creates its own hybrids. This is also a good time to remove Myosotis scorpioides or forget-me-nots. Wonderful airy pale blue blooms are delightful in the early spring, but this plant has finished blooming and most have started going to seed. If left in the garden it will most likely soon develop powdery mold, making it unsightly and a possible contamination to other plants. Go ahead and pull the entire plant and don’t worry, there will be plenty more to replace it next spring.